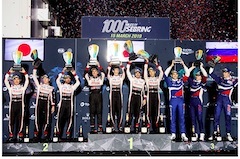 TOKYO, Mar, 18 2019 - (JCN Newswire) - TOYOTA GAZOO Racing conquered the 1000 Miles of Sebring to extend its advantage in the FIA World Endurance Championship (WEC) with a one-two victory in the sixth round of the 2018-2019 season. 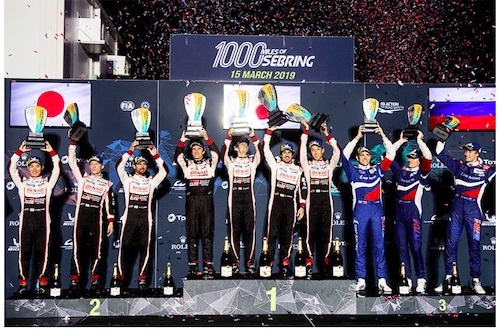 Sebastien Buemi, Kazuki Nakajima and Fernando Alonso in the #8 TS050 HYBRID took the chequered flag after eight hours to win their third race of the season in front a large and enthusiastic Florida crowd to stretch their World Championship lead to 15 points. Mike Conway, Kamui Kobayashi and Jose Maria Lopez overcame a mid-race delay for accident repairs to earn second in the #7 TS050 HYBRID, one lap behind, achieving the team's fifth one-two of the season. Kamui's fastest lap of 1min 41.800secs set a new race record and wrote another chapter in Sebring's history, following Fernando's all-time fastest-ever lap in Thursday's qualifying. The team's first race at Sebring began in bright sunshine and with air temperature of 28 degrees Celcius as Sebastien, in the pole-sitting #8, established himself as race leader from the beginning, with Jose putting pressure on just behind in the second-placed #7. That pattern continued until a brief rain shower just before the two-hour mark. Soon after that the #17 SMP car crashed heavily, causing a full course yellow and then a safety car to repair barrier damage. That closed the field, bringing Kamui in the #7 closer to Fernando in the #8 and the battle resumed after 15 minutes. Despite adverse forecasts, heavy rain in the local area missed the track and the TS050 HYBRIDs kept up a close fight as darkness fell. At half distance, Kazuki in the #8 was holding off a charging Mike just a few seconds behind, with both cars three laps clear of the third-placed #3 Rebellion. But a titanic duel between the two TOYOTAs was brought to an early end after four-and-a-half hours when Jose, at the wheel of the #7, suffered a minor contact with the #90 Aston Martin. That required a change of engine cover and rear bodywork, which cost four minutes in the pits, putting the car a lap down. With that clear margin, Sebastien in the #8 took a no-risk approach through the famously-difficult Sebring traffic, taking care to protect his lead. The #7 crew showed strong spirit to come back from the disappointment of losing a lap and set competitive times to comfortably extend their advantage over third place. The final three hours of the race looked to be passing without major incident as the TS050 HYBRIDs once again demonstrated remarkable reliability on a circuit famed for being tough on cars and drivers. However, the Florida weather intervened and rain began to fall around half an hour from the end. With the chequered flag approaching, the intensity of the rain increased and both cars pitted with 20 minutes remaining to change to wet Michelin tyres. But as conditions worsened, both cars returned to pit lane to switch to extreme wet tyres with the target of simply avoiding any incident and reaching the flag safely. That became slightly easier when a safety car was called with only 12 minutes remaining due to an accident for an LMP2 car. With heavy rain continuing, even driving behind the safety car was challenging but Kazuki stayed calm and brought the #8 home for victory, followed by Mike in the #7. That means, with two races remaining in the 2018-2019 season, TOYOTA GAZOO Racing leads the teams' World Championship by 53 points going into the 6 Hours of Spa-Francorchamps on 4 May, when its target will be to seal the teams' World Championship with a race to spare. "I am very pleased that TOYOTA GAZOO Racing and our TS050 HYBRID is the first winner of the 1000 Miles of Sebring. Our visit to Sebring has been challenging but successful. Everyone in the team adjusted very well to the different requirements here and pushed really hard to achieve this result. Thanks to them and also a big thank you to the fans here in Florida; they have made our first visit here really special with their passion for endurance racing and their warm welcome. I hope they enjoyed the race and I wish everyone an exciting and successful Sebring 12 Hours tomorrow." "Another one-two is a good result for everybody on the team. We pushed hard all the way through and it was a nice fight in the first half of the race. We all had some close moments out there; you get so close to the GT cars. At the end the conditions were really tricky; it was like driving on ice, particularly on the concrete sections. It's a pity that we lost out today but we still have Spa and Le Mans coming up so we will keep pushing." "Car #8 did a great job and deserved this win. We fought hard but after the contact we could not challenge. Still we showed our spirit and continued to push in the second half of the race even though it was not easy. It's important not to give up. For the team, finishing one-two is a great result so thanks a lot to them for their hard work; the big preparation paid off here." "Congratulations to car #8; our team-mates did a fantastic job. It was a very hard race and from my side I was struggling a bit in traffic today. I was trying to catch Seb and I just misjudged a move on a GT car. We were unlucky but these things can happen sometimes and after that I just looked forward and kept pushing. Fortunately the car wasn't badly damaged and we could finish the race. I am pretty happy with second place in this hard race." "I am really pleased to be in the middle of the podium again after quite a long wait. It was a tricky race because the traffic here is not easy. In my first stint Jose was really quick so I had to push. We wanted to make a gap but the #7 was within 10 seconds for many hours until they had the contact. I did the best I could to minimise the risk and stay cool. When the #7 had the contact we took it easy and just got to the end without any dramas." "It's great to win here in Sebring, especially after such a tough race. Maybe it looked straightforward from the outside but in my first stint I had a bit of traffic so it was already hard. When I jumped in at the end I knew what I had to do; get to the end without any risk. I was happy with the car in dry conditions but not at all happy in the end in the rain. Visibility and grip were amazingly low so I was really happy to see the chequered flag." "It is a happy day for us. We came here to this very difficult circuit and we did a lot of testing and preparation. We went into the weekend feeling confident we would have a strong race, particularly starting from pole position. From the lead of the race, we tried to manage the risk. The rain was very stressful but Kazuki did a fantastic job in difficult conditions to bring home another win at a historic venue for endurance racing."